With 30 rainforest properties now protected in Australia, our vision is to rescue a further ten strategic vulnerable blocks in the Daintree. Your precious support is needed more than ever in the effort to Protect Rainforests Forever. UPDATE,15 Jan 2018: Amazing result! We've reached our target two weeks before the deadline and have started the conveyancing process to rescue our No.1 priority vulnerable rainforest property in the Daintree. We'll post more news on this later in the week - Thank You. We're moving on up! This year, with your generous support, Rainforest Rescue secured a 30th vulnerable rainforest property in Australia. This is a huge achievement and we couldn't have done it without you. We're working hard to ensure that all these properties are protected forever. We have huge momentum behind us, and a clear vision for the future. With a dynamic, committed team, and with your enthusiastic support, we aim to secure, and protect forever, a further ten threatened rainforest properties over the next four years. We're really excited to launch Rainforest Rescue's #next10 campaign. Each rainforest property under threat will be carefully identified, with priority given to properties that fit with our strategic vision. This is to create vital wildlife corridors that allow the safe passage of rainforest fauna and flora, protecting biodiversity for future generations. Our purchase of rainforest under threat is always strategic, never scattergun. We care more about our contribution to conservation than numbers per se. We hold out for properties of significant strategic conservation value, ensuring that we use supporters' donations to the best possible effect. We take our duty of care to our supporters very seriously. Our #next10 campaign requires focus, resilience, and a passion to continue a project that has been 19 years in the making. We hope that you are as keen as ever to continue this journey with us. We can't do this without you! 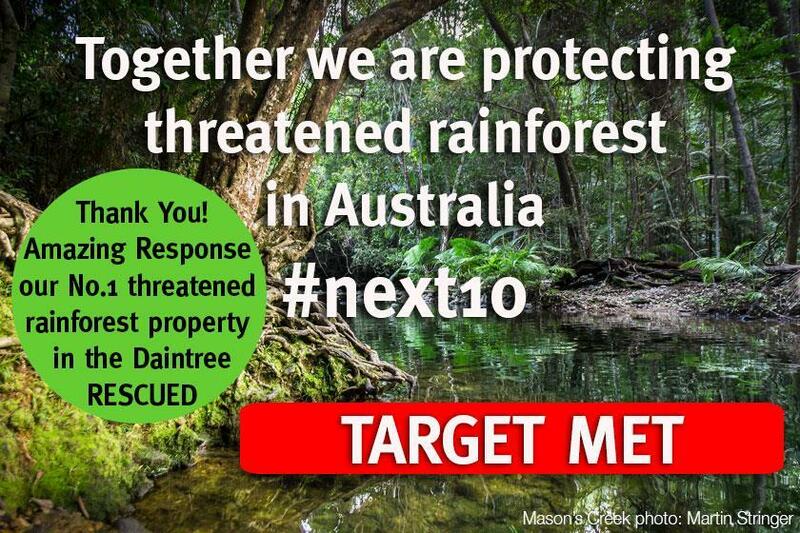 Please support Rainforest Rescue's #next10 campaign, helping us to rescue another piece of rainforest under threat. As part of Rainforest Rescue's #next10 campaign, we've identified three priority Daintree properties that are under threat and we hope to acquire these as soon as possible. We're aiming high! Each property links to a current Rainforest Rescue wildlife corridor or connects upland World Heritage Area and National Park to the lowland rainforest and coast. These strategic acquisitions will deliver vital protection for the rainforest. Of the 30 properties saved by you and fellow Rainforest Rescuers in Australia, 22 are protected with covenants stripping development rights and protecting them forever. In addition, two further properties have been gifted to the National Park. We are working with the Department of Environment and Heritage Protection to protect the remaining six properties by adding them to our family of Nature Refuges. The Rainforest Rescue Board have made a strong commitment to never sell off land for development, no matter what the short-term gain may be. I know you care deeply about Australia’s unique rainforest, and want to ensure its conservation. It’s vital that we keep up the momentum and do all we can to protect the Daintree. Your important gift today can help stop the destruction of our extraordinary rainforests. For Health, Heart and Humanity. Here we go - more rainforest rescued! I love the Daintree and love that you are working to preserve important sections of it. We can re-forest and re-green Australia!!! Keep up the good work. Two hands working can do more than a thousand clasped in prayer! This would be easier if our login linked to our address. In honour of Toni Lawler's life of conservation. We need to protect the Daintree! Check @dogoodbygloria for the shout out I gave you guys last month.